Raymond Corona, founder of Corona Optique, has been practicing optometry for nearly thirty years. He provides comprehensive eye care for adults and children alike, including therapeutic treatment of various ocular diseases. He has been a member of the American Optometric Association and the Arizona Optometric Association since he began practicing in 1977. 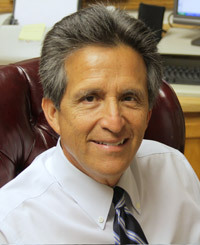 Dr. Corona was born in Williams, Arizona. He received his Bachelor of Science degree from Ohio State University and went on to earn his degree in Optometry from the Southern California College of Optometry. He moved to Yuma in 1983 where he is deeply involved in several community organizations. Corona and his wife, Kelley, are the parents of four boys, and have four grandchildren.